The difficult trading conditions of the mid twenties prompted triumph to produce a machine that could under cut its rivals on price whilst retaining the excellent finish that had become associated with the firm. 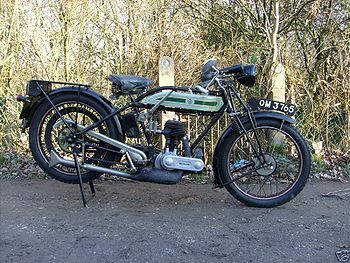 introduced in 1925, the Triumph model P succeeded in achieving triumph's aims, selling for £42 17s 6d, a figure that only bsa could approach with their 493cc 3 ¢ at £44. the new machine was entirely conventional with a side valve engine, three speeds and chain drive, although the early contracting band front brake was unusual and somewhat marginal in performance, it was replaced when the second batch of machines was produced, the first 20,000 having been built at the rate of a 1000 a week during 1925. This page was last edited on 21 January 2011, at 17:02.